Last Thursday the wooden rail bridge over the Colorado river, some miles north of San Saba TX, caught fire and burned in a spectacular display, despite the efforts of a league of firefighters who fought the flames for 15 hours before letting nature take its course. Friday a truck hit the overhang of a crossing bridge over the Skagit River in Washington, causing a section to collapse and tossing three cars into the river. Emergency responders rescued the three drivers some time later, but it must have been a harrowing experience nonetheless. Another collision affecting both cars and trains resulted from the collision of two trains yesterday, dumping two cars containing five people (who were treated for minor injuries) off the highway overhead onto the rail lines below. Two people on the trains were injured as well. According to SaveOurBridges.com there are over 8,000 bridges in the US that are structurally deficient and fracture critical – adding up to about 160 in every state in the union – that thousands cross each and every day. You can see what nearby bridges might best be avoided by plugging your zip code in the site's interactive map. Many of these are urban interstate intersections with flyovers dating back to the Eisenhower Administration. Others cross major rivers adding to the expense of rebuilding or updating the spans to modern standards. 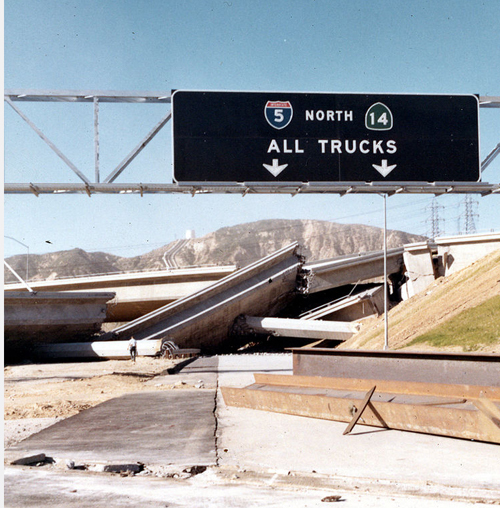 The image here is what happened to the Newton Pass Interchange in 1971's San Fernando Earthquake - what quakes can do to new highway spans, age and decay does to the older ones. This span over the Garden State Freeway in New Jersey is the government’s top priority for repair or replacement. This bridge is traversed by 208,000 cars daily and rates a startling 79.8 percent structural deficiency. When the I-35 bridge over the Mississippi River collapsed in 2007, it had a structural rating of 50 percent – the Raritan River Bridge is more precarious and dangerous than the I-35 bridge was at that time six years ago. The Lake Shore Drive Bridge over Wilson Avenue in Chicago is traveled by 114,000 commuters every day and is collapsing from the weight of the traffic. Rather than rebuild the bridge city planners have installed nets to keep the chunks of concrete falling off the span from blocking Wilson Avenue below. Brooklyn’s Lee Avenue Bridge frequently shows up urgent repair lists and was used by 202,650 cars per day until it was closed in 2009 for repairs which are still ongoing. It had a structural deficiency rating of 68 percent; meaning commuters were placing their lives at fate’s whim every time they crossed. In the San Francisco area, traffic is not the only stress on the bridges and highway overpasses – in Northern California engineers must grapple with the threat of major earthquakes as well. An eastern span of this bridge collapsed in 1989 during the Loma-Prieta earthquake. It has been under reconstruction for 11 years as designers grapple with the fact any major quake would destroy the cantilever span. It is scheduled to finally reopen this coming September. The odds of that quake coming over the next few years are reportedly about 7 out of 10. Most US bridges were built to last 50 years, but many have passed that milestone lately if not long ago. New York has 2,088 structurally deficient bridges and the one at Verrazano is considered the worst of all with 170,000 daily commuters. The bridge over Liberty Street in central Winston Salem NC is known to be so unsafe it is referred to as the Death Bridge. Part of the Highway 40 Business Loop, 476,000 cars cross it every week. Fortunately this bridge will finally complete its reconstruction this year. The link shows the new bridge with no traffic, while a few cars are still crossing the old bridge. It is sometime said the squeaky wheel get the grease. The worst cases draw our action, but that still leaves thousands of bridges still needing attention. America did not get to where it is today by sallying forth timidly - on the other hand, it makes little sense to rush blindly into oblivion or chaos. If it avoids a dangerous bridge, perhaps the road less traveled is the better path.